Whether on a pewter plate with sauerkraut, or with potato salad, or as “three in a roll” (Drei im Weggla) – Nuremberg roast sausages are among the most popular delicacies in the Franconian metropolis. Thumb-sized and crisply brown, that’s how they should be, and they are best fresh from a charcoal barbecue. Numerous legends surround the “invention” of the Nuremberg roast sausage. For example the delicacy is said to be so small so that it could be sold to hungry (and paying) customers in mediaeval Franconia, after the town gates were closed, by being passed to them through the keyhole. One thing is certain: even in the Middle Ages, people in Nuremberg preferred quality rather than quantity and liked the smaller, finer sausages better than the coarser Franconian ones. Thanks to the city’s lively oriental trade, people in Nuremberg had spices available even in the Middle Ages. Then, as today, production of the sausages was strictly quality controlled: only high-quality pork without veins and rinds and a mixture of herbs and spices with the typical marjoram note are encased in thin sheep casings, and twisted into links seven to nine centimetres long. The sausages have a diameter of about one and a half centimetres and weigh in at about 25 grams. Since August 2003, “Nürnberger Bratwürste“ (Nuremberg Sausages) and “Nürnberger Rostbratwürste“ (Nuremberg Roast Sausages) have been protected EU-wide: only sausages manufactured within the city limits to traditional recipes may carry this name. 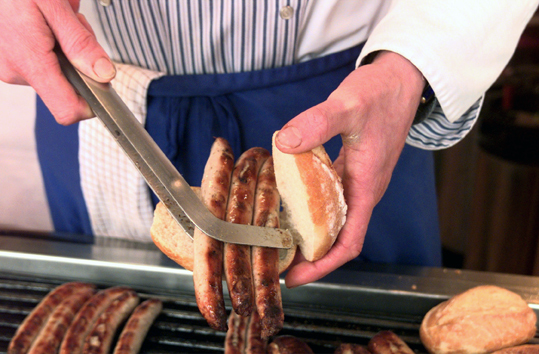 Every year, over 800 million sausages are produced here – and sold all over the world.